The key to a great turkey burger is finding a way to keep it moist. Adding the seasonings, both wet and dry, to the meat before it’s cooked, results in a juicy and flavorful burger. I make the meat mixture a few hours in advance of cooking. This allows for the turkey to soak up all the flavors as it sits in the refrigerator. There’s this fantastic BBQ joint in Rochester, New York called Dinosaur Bar-B-Que. I always make a big batch of their All-Purpose Red Rub. I keep it in an air-tight container, then it’s ready to use when I need it. Their rub was perfect for these burgers. Saute the shallots and garlic in 1 tbsp of olive oil on medium-low heat in a small fry pan, until softened, but not browned. Take the pan off the heat and let cool. In a small bowl combine the mayonnaise, the remaining tbsp of olive oil, lime juice, 1 tbsp BBQ rub and the cooled shallots and garlic. Put the turkey meat in a medium bowl and combine with the mayonnaise mixture. Form into 4 equally sized patties and refrigerate for at least 30 minutes… a few hours is even better. Preheat the grill. Rub peppers lightly with olive oil and sprinkle with the remaining tbsp of BBQ rub. Rub a little olive oil on each side of the burgers and sprinkle with kosher salt and fresh ground pepper. Grill the peppers whole, turning frequently until they have a nice char. Set the peppers aside to cool and slice into large pieces. Grill the burgers until cooked through. I grilled the rolls a bit so they were nice and crisp. 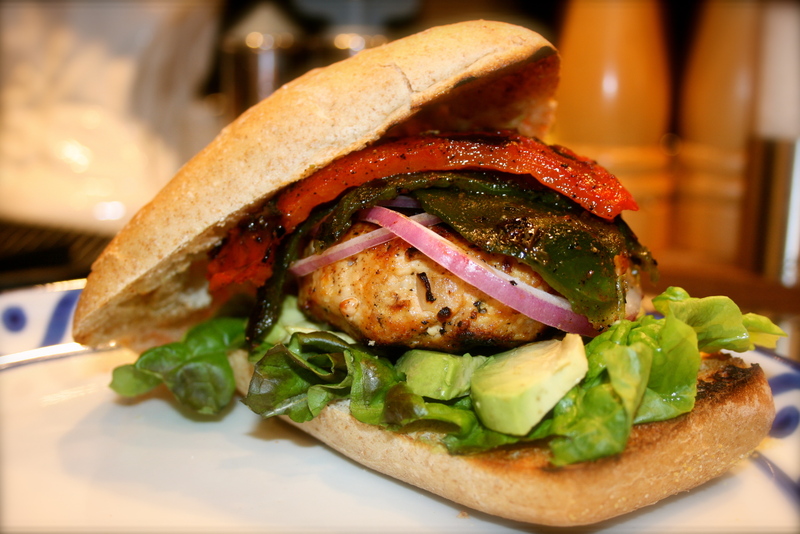 To assemble burgers… layer each burger with lettuce, roasted peppers, red onion and sliced avocado. A squeeze of more fresh lime juice can finish it off and help cut the heat if your poblanos are really spicy.